This two disc package consisting of one CD and DVD of the same concert is the first of its kind to be released from the series of VH1 Classic Decades Rock Live. The theme of the concert comes to showcase long standing artists of rock paired with some of today's hottest recording acts who have been influenced and inspired by these legends. A potted history of Bonnie Raitt's career was given in a review of her last album "Souls Alike", but to cut the long story short, in the early 70s she began recording a series of albums that drew material from America's rich musical heritage of blues, country and folk and also gave exposure to the new songwriters such as John Prine and Jackson Browne. Since being dropped by Warners in the eighties when she was considered an artist with a cult following, she was signed to Capitol and has enjoyed enormous success with the "Nick Of Time" album and he last set "Souls Alike" debuted at number 19 on the American Billboard charts a year ago. On this collection she is joined by whom she calls her 'new friends' Norah Jones, Ben Harper, Alison Kraus and Keb Mo. country hoedown feel to "Papa Come Quick". Ben Harper takes the stage to duet on "Two Lights In The Nighttime" which is performed in the style of the sixties soul duo. He stays on stage to follow that with a rendition of a Bob Dylan song "Well Well Well" which is one of the few acoustic performances in the concert. 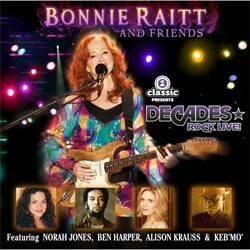 What this package may do, with it featuring current big hitters like Norah Jones and Ben Harper is raise Bonnie Raitts profile in the UK, where she has never enjoyed the popularity she has in the USA.